Olive’s leaf tea has already been used for centuries as a powerful therapeutic tool. It is particularly effective to stabilize blood sugar, namely it is excellent to control diabetes. Thanks to oleuropein, extract of medicinal plants has antibiotic effect and prevents the reproduction of cancer cells. We all know the beneficial effect of olive oil on health. However, it is known that the olive leaf has a great therapeutic value and for centuries was used in the natural treatment. In this article learn how to make tea from olive leaves and what are the benefits of drinking this tea. How the olive three looks like and where it grows? Olive is a subtropical, evergreen plant that grows over a wide area of ​​the Mediterranean. Thanks to tiny fruit from which it drains precious oil, it is synonymous with a healthy diet. It is a very durable plant that grows in dry areas, and many olive trees are old. The oldest olive trees will still provide quality fruits. The oldest ones are close to 3000 years old and can be found on the Greek island of Crete. In nature, it grows as a shrub, but when cultivated it develops into a tree. Olive leaf is elongated, dark green, and the fruit is small, oval and bright-green to black. Especially popular is olive leaf tea which has extremely healing effects. The leaves are harvested before ripening fruit and then choose only young, peak leaves. When do you pick olives? Ripening process of olives is a very complex process. It takes place unevenly and, depending on the latitude, it happens from July to October. During this period the plant goes through important biochemical changes, because the whole plant in the fruit sends nutrients. Ripening begins at a time when the fruit has not reached its full size. The first sign of the beginning of these complex processes is the change of the skin color of the fruit. This is the moment when the leaves are plucked. Olive Leaf is rich in antioxidants polyphenols, but a matter that particularly engages the attention of scientists is oleuropein. It has strong antifungal, antiviral and antibacterial properties. Leaf extract is also used as a natural remedy to combat microorganisms. These are: fungi, bacteria, protozoa and viruses that cause a range of diseases. Today you can buy ready-made tea and olive leaf, dry extract, tincture and oil to be used for such purposes. Olive leaves may have an important role in the natural treatment of cancer, as well as in the risk of developing this disease. First of all because of the ability to stop the process of angiogenesis (growth of new blood vessels that supply the tumor). Scientific tests have revealed that oleuropein has a strong antioxidant effect. It will prevent reproduction and migration of tumor cells. 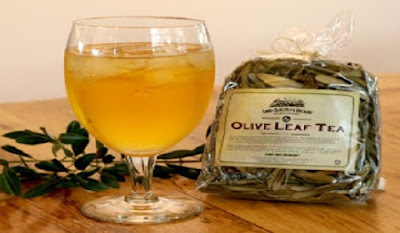 Olive leaf tea certainly needs to be used by people who suffer from hypertension and high levels of triglycerides. It will fully keep the levels under control. Research about antibiotic properties of olive leaves give good results. In fact, popular topics today are super bacteria. Today, some of them are resistant to commercial antibiotics. Thus they fall in the group if extremely dangerous – deadly ones. The good news is that mentioned super bacteria are not resistant to the natural anti-bacterial substances. Olive leaf tea provides us with that, since it contains a number of complex substances. One of the most important advantages of the tea from fresh olive leaves is that it suppresses the infection at an early stage. Represents a natural remedy for pneumonia, hepatitis B, meningitis, tuberculosis, malaria, candida and gonorrhea. Olive leaf is also effective in the case of an ear infections, urinary tract infections and inflammation of the mouth. Olive leaf extract can significantly reduce the redness of the skin, improve blood flow and dehydration, even better than vitamin E. It has been scientifically established that it protect against skin cancer, so it suppresses the multiplication of cancer cells and causes cell death. This is particularly important in the early stages of melanoma, when it is advisable to drink olive leaf tea. Also it eliminates surface damage to the skin, including signs of aging. Arthritis is an inflammatory disease of the joints that is manifested by pain and swelling. Since olive leaf tea has anti-inflammatory and regenerative properties, it is used in natural therapy to relieve the symptoms of this disease. Leaf extract is a powerful enhancer of the immune response, and has antioxidant effects, it is an aid in the treatment. It is particularly effective in osteoarthritis and rheumatoid arthritis. This soothing drink has an extraordinary effect on the diseased bones and joints. At the same it benefits diabetics who can drink it without hesitation. We will share with you a few recipes. Teaspoon of dried leaves with olive pour with 2,5 dl of just boiled water and leave it on the stove for another two or three minutes. Remove the obtained beverage from the stove, with the top cover and let it stand for ten minutes. Strain and gently drink after a meal. Bitter taste of tea olive leaf can be corrected with a little lemon juice. Make a mixture of 20 g of hawthorn blossom, chamomile, olive leaf, mistletoe and garlic. Two tablespoons of tea, pour with 3 dl of boiling water, cover and let it stand for two hours. Strain and drink before meals. Approximately 30 g of dried olive leaves cover with half a liter of cold water and leave it to stand for eight hour. Then submerged leaves put on the stove and cook until the water boils. Remove tea from the heat, cover and leave for 20 minutes. Drink twice a day 2.5 ounces. Mix one tablespoon of coconut oil and apple cider vinegar. Add 3 tablespoons of honey to them, 20 drops of tea tree oil and 10 drops of olive leaf extract. The product discharge into the appropriate glass packaging and store in a cool place. Stir 4 tablespoons of coconut oil, 2 tablespoons of baking soda and 20 drops of essential oil of cinnamon or cloves. Add 20 drops of menthol and 15 drops of olive leaf extract. Put the mass into a glass container and use once a day - a toothbrush is applied to the gums and gently rub. In addition to everything mentioned above it is great for strengthening the immunity and for this purpose medicinal tincture is excellent. About 100 g of dried olive leaves or 150 g of fresh ones put in a jar and cover with brandy. The leaves must be completely submerged. Keep the jar for six weeks in a cool, dark place. Then strain and content return to the jar. Cover the bowl with gauze and put in a warm place so the alcohol can evaporate. A dense mass that remains is placed in a glass container and stored in a dark place. Tincture of olive leaves is an excellent prevention of the disease. It is used simply - a nugget the size of a pea is diluted in 50 ml of water. In the glass bottle a tablespoon of peppercorns, a hot pepper, a sprig of rosemary, 15 sheets of olive and bay leaf. Pour oil on the top. Leave the container in a cool, dark place for a week. Spend two tablespoons of this oil to make an aromatic salad dressing. This soothing drink can be found in the better-equipped bio-stores and pharmacies. Olive leaf tea price moves from 2 to 4 dollars for 100 grams, depending on the manufacturer. Always take it in bulk, as it is much healthier than tea bags. Other products like tinctures and extracts are also available in better equipped herbal pharmacies. If ordering online, previously inform yourself about the product itself. On the preparations there must a statement that it was obtained from dried leaves. Chemical substances in the olive leaf may affect the action of antibiotics, but you should avoid using them at the same time. Therefore, if you are taking about the above mentioned drugs, skip the consumption of this beverage in this period of time. Tea from olive leaf lowers blood pressure, so keep that in mind and adjust only the prescribed quantity. Also, all products based on dried olive leaves are not recommended for pregnant women not breastfeeding women. We use this opportunity to recommend another phenomenal beverage – tea from mountain Rtanj.